Description: Give this grass plenty of room! 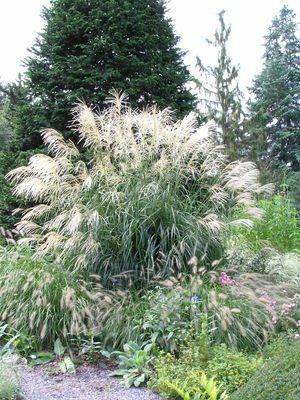 The tall, variegated Japanese silvergrass, ‘Silver Feather, originates from eastern Asia and has a graceful arching habit. Its long slender blades are dark green with razor thin white midribs and turn a beautiful wheat color in autumn. In the late summer to fall, Miscanthus sinesis 'Silberfeder' produces large feathery, silvery-pink plumes that stand well above the arching foliage and remain attractive throughout winter. Bloom Time: Looks great all the time! Outstanding Features: Great all through the year, looks wonderful cut and dried or mixed in in flower arrangements. Uses: Specimen or mass in beds, borders, water margins or as a screen. Provides winter interest.